You must have heard about Bibliography when creating your school, or college assignments and even used it. Whenever we used to create some assignment then at the bottom of the same, we used to write the bibliography of the same. Means, the reference to all those sources from which we took help for creating that particular assignment so that the reader can know about the source of the assignment and if needed then the reader can also look for the information with the help of the references which we included in our assignment in the bibliography section. Bibliography comes quite important when writing the thesis. It becomes essential to keep track of all the sources you took help from. You have to mention about the original work which inspired you in completing your project. All the sources which you considered during your research that influenced your ideas and facts should come under bibliography of your report, assignment, thesis etc. Bibliography helps to add legitimacy to your writings. But you can’t simply create bibliography just by writing the name of the book, website etc which is the source of your writing as there are some formats and rules for writing a bibliography. Like if you want to add a book to your bibliography then you have to write in following way, Author’s Last Name, Author’s First Name. (Publication Year) Title. Publisher’s City: Publisher. Page numbers according to American Psychological Association. Same way there is a particular format to include an article, website etc. in your bibliography. So, yes, it becomes a little difficult to create the bibliography with all these details and according to the international standards. It would also be quite time-consuming to first find all the required details of the source. There is a way which can make the task of making a bibliography and the Citation quite easier and that is Bibme. 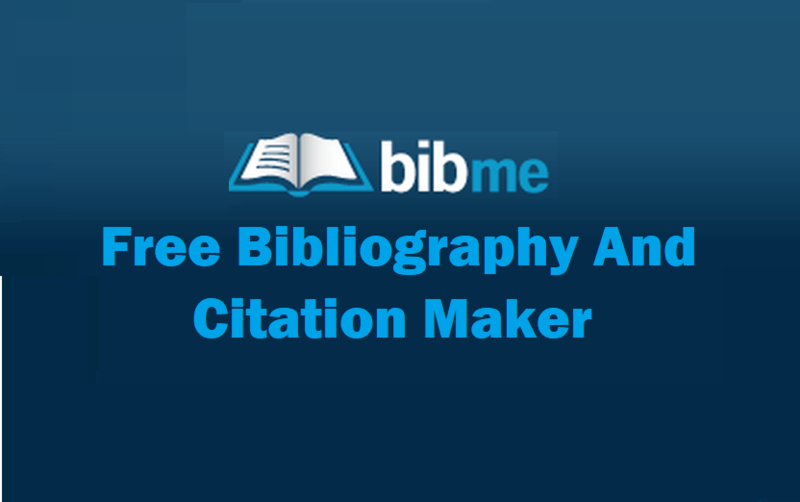 Bibme is a free bibliography and citation maker that you can use to create your bibliography and citation pages. Let’s get to know about Bibme in depth. Bibme is an automated free bibliography and citation maker as I said earlier. It was created by students as their semester project and went live in 2007. Later it became quite popular as students found it very handy in making bibliography and citation. It saves a lot of time in finding source information, typing and then formatting it in the form of citation. Bibme helps you to save your time and the efforts too. Here are some of its best features which make it very handy and popular free bibliography and citation maker. Bibme is pretty simple and user-friendly. It supports a very easy method to create bibliography and citation. The interface of the website is also very well designed and all the things are self-explanatory so that the user doesn’t find any difficulty while using Bibme. You only have to put few thing in order to create your citation and bibliography and the rest of the thing is done by Bibme itself. Just follow the instructions and within a couple of minutes, your citation will be there in front of you in the perfect and desired format. This is why people love Bibme. It provides an auto-fill information feature which searches and fills automatically the information about the source of which you want to make a citation. You only need to enter the source name whether it is website URL, book, video or any other source it collects the information automatically. The main sources of the information collected by Bibme are Amazon.com, find articles, Yahoo news, and CiteULike Academic Papers. As I said before that citations can be write in multiple formats depending on your preferred choice. Bibme supports all the popular formats of making bibliography and citation. You can create your citations in APA, MLA, Chicago, AAPG Bulletin, academic questions, accounting forums and so on whichever you need. You can also save all you citation to Bibme for using them later. But for the same, you will have to create an account which is totally free. And after that, you can save any citation to your Bibme account with ease. 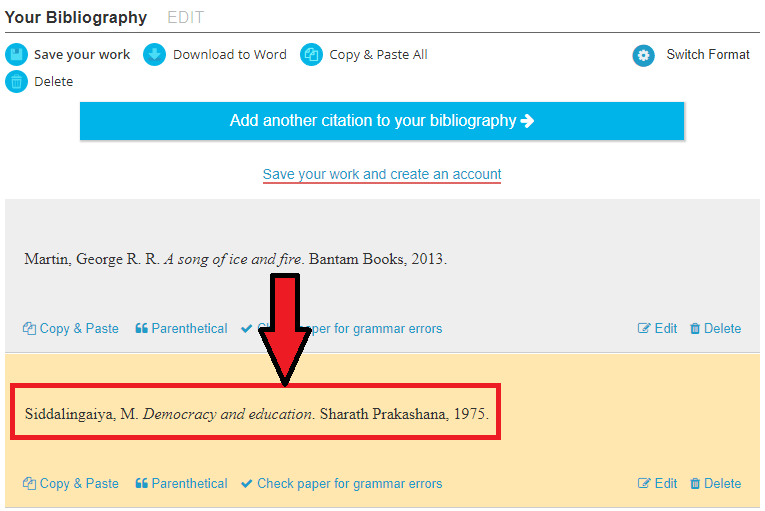 Using Bibme for making free bibliography and citation is pretty simple. Create citations within a very short time and without putting much efforts. 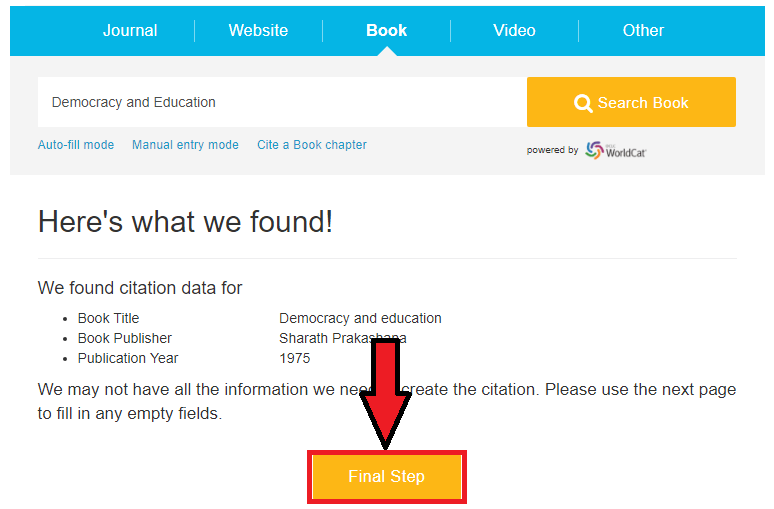 So, here all the steps involved in making bibliography and citation using Bibme for free. The very first step is to visit the official website of Bibme. At the home page of Bibme, you will see a form. Well, this is where you will start creating your citation. So, first select the format of the citation. Simply select the desired one from the given options. Now you have to select the type of the source whether it is a journal, website, video or any other thing. After that, it will provide you the links of the source and you need to select one by clicking the site button. Then Bibme will scan the details and provide you what it has found and you simply click on the Final Step button to complete the procedure. Bibme will aut0fill the details of the source and if you want to more details then you can also do that. After that, just click the create citation button. Your citation will be there in a few seconds. If you want to save the citation to your bibliography then you have to create an account which is totally free. You can then download the citation to the word, copy and paste it anywhere, or delete. I liked Bibme very much. 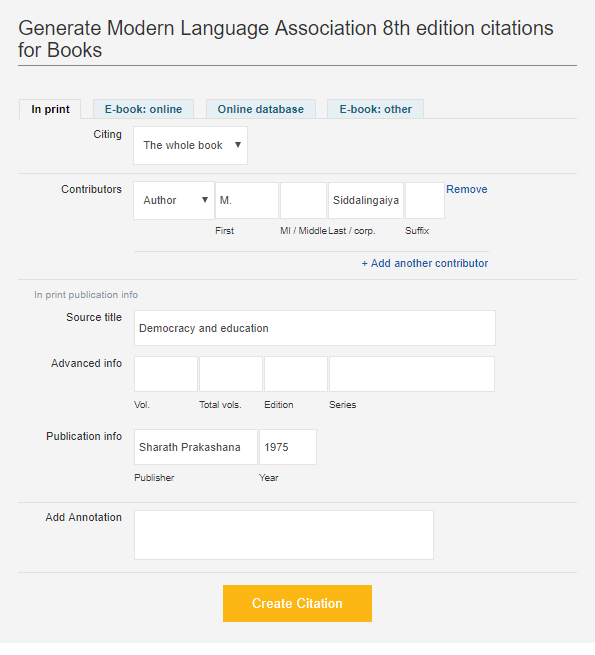 It is an amazing and very helpful tool for making citation and bibliography quickly. I don’t find any con on this website, all I can see are the efficient features and the ease of use Bibme provides to its users. once you use Bibme for creating your bibliography, you will never look for any other tool for the same purpose.